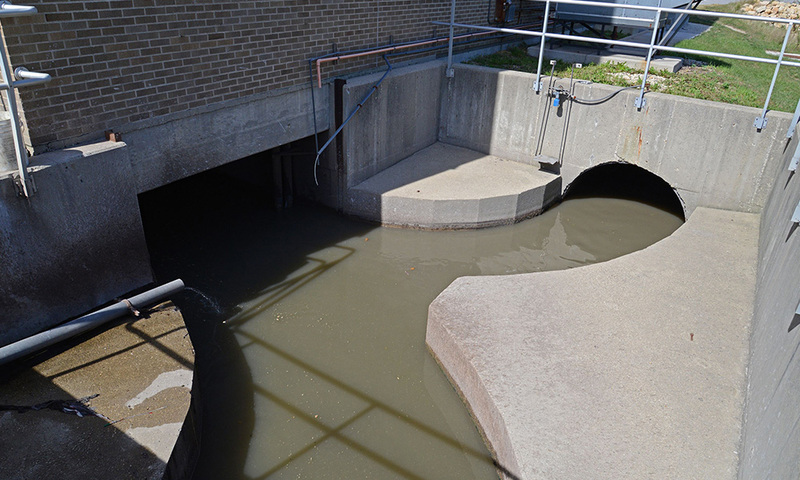 1Untreated sewage, called the RAW INFLUENT, enters Fox Metro's wastewater treatment plant at the BAR SCREEN & GRIT COMPLEX. The raw influent enters the bar screen building through an intake structure, an opening which allows the plant operators to visibly detect if anything unusual is entering the plant. 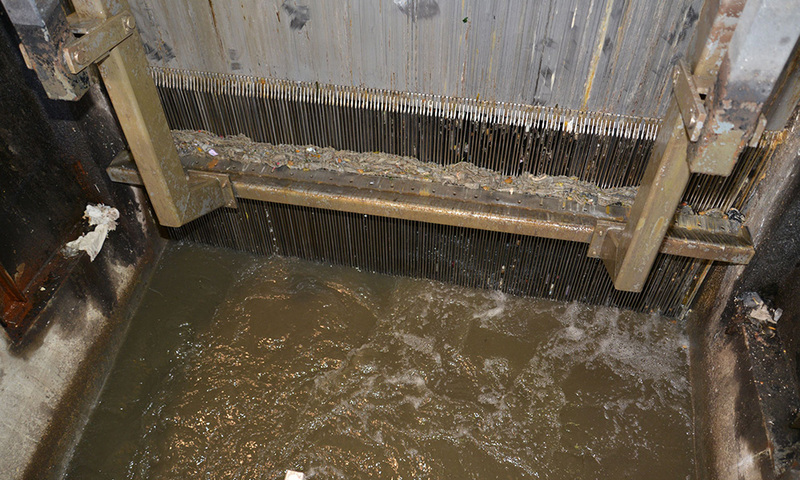 The wastewater next passes though BAR SCREENS, a series of parallel steel bars spaced 3/8th of an inch apart, to remove large objects such as sticks and rags. The screened wastewater then passes into GRIT REMOVAL TANKS where its flow is slowed so that sand, gravel, and other coarse non-organic matter settles out. The materials removed at the bar screens and the grit removal tanks are trucked to a sanitary landfill for disposal. 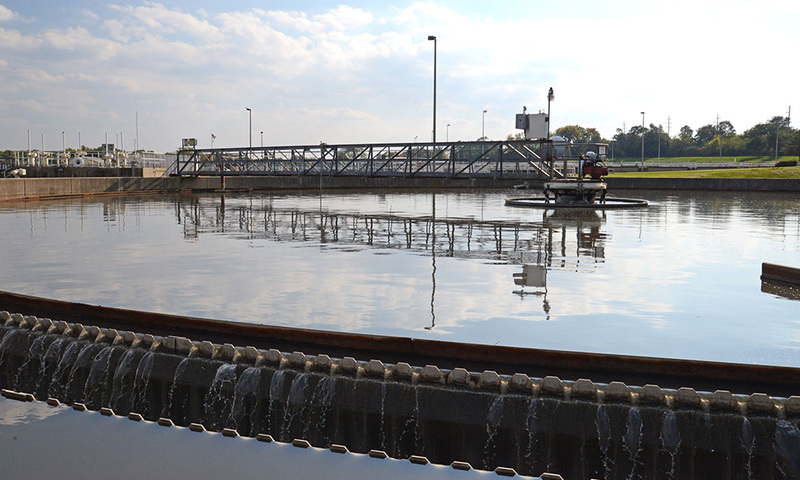 The screened and degritted wastewater then flows by gravity to the MAIN PUMP STATION & CONTROL BUILDING. 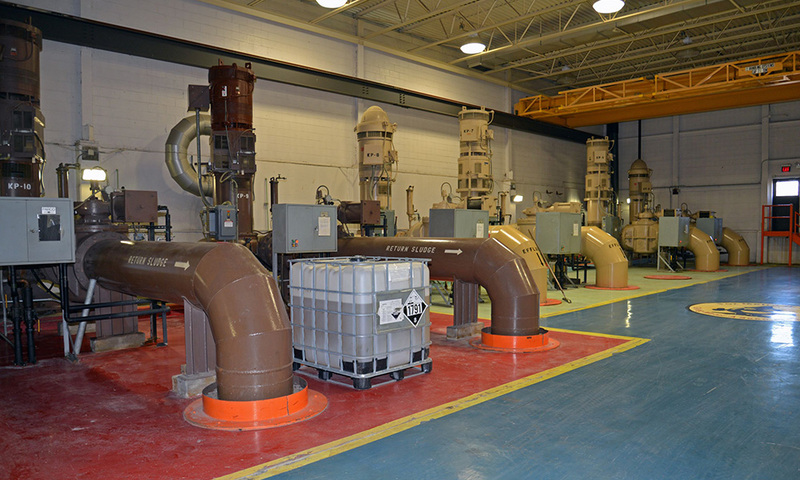 Here, large 75-300 horsepower pumps push the process flows to the different treatment units. Motors, pumps, valves, and various process monitoring devices located at various points throughout the plant can be remotely operated and observed from SCADA linked computers. The flow is pumped from the main pump station to the 135 foot diameter, 12 foot deep PRIMARY CLARIFIERS. Here oily materials, called SCUM, float to the water's surface while heavy particles of organic materials, called PRIMARY BIOSOLIDS, sink to the tank's bottom. 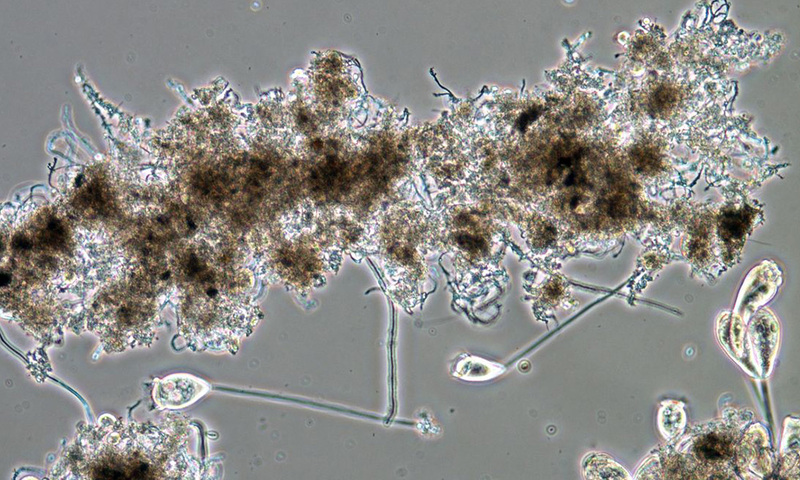 The scum and primary biosolids are removed by collection devices and are pumped to a solids treatment process. The primary clarifiers remove about 50% of the pollutants from the water during the 1-2 hours it spends in them. 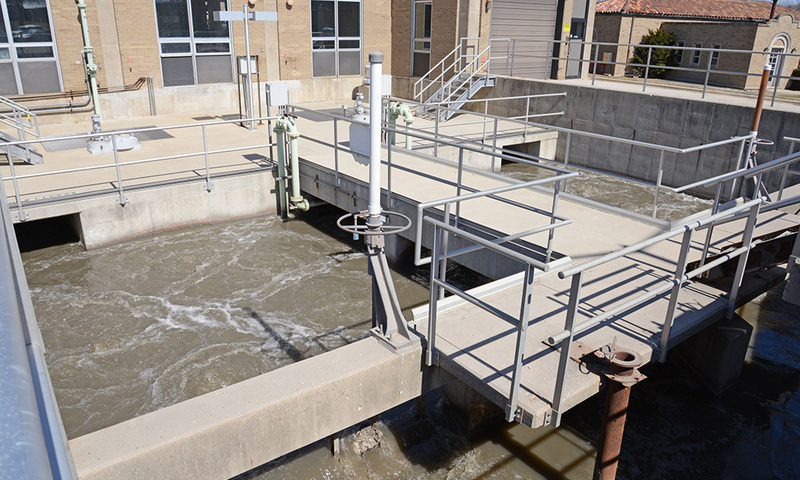 The flow is next pumped to the AERATION TANKS where a dark colored mixture of naturally occurring micro-organisms, called ACTIVATED BIOSOLIDS, is mixed with it. 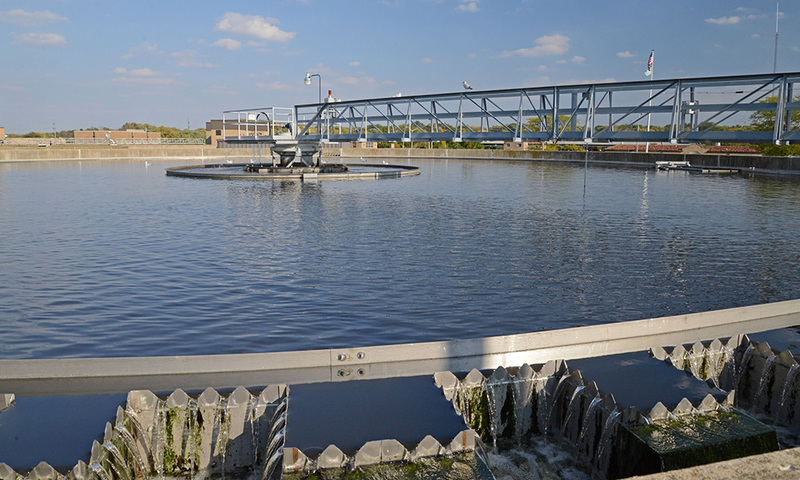 The activated biosolids use the dissolved organic pollutants in the flow as a food source and converts potentially toxic levels of ammonia into nontoxic nitrate. 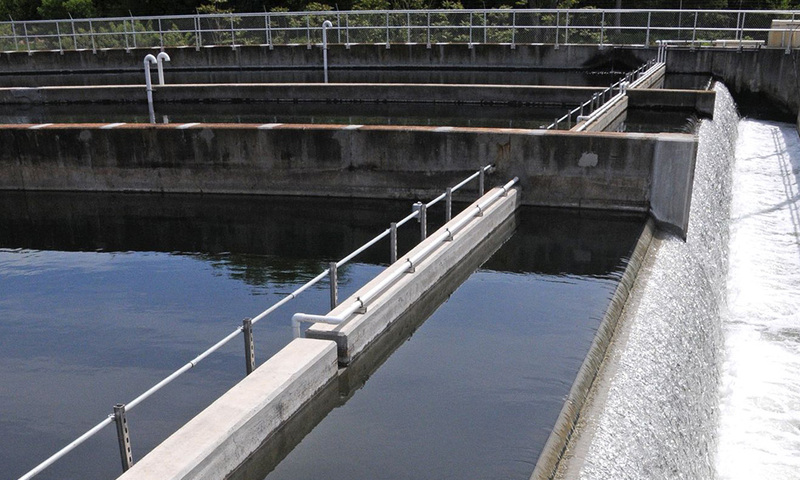 About 99% of the common pollutants have been removed from the flow by the time it leaves the aeration tanks. 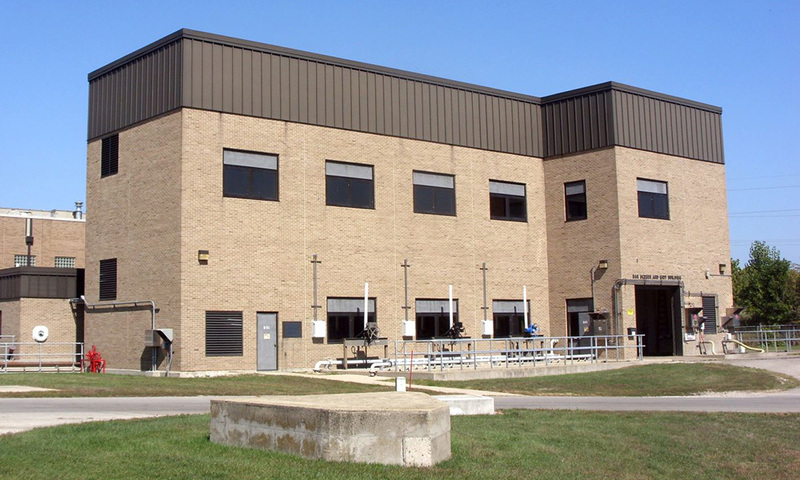 Air, which the activated biosolids use in their metabolic process, is supplied from the BLOWER BUILDING. Here a combination of 900, 200, and 150 horsepower blowers force filtered atmospheric air through FINE BUBBLE DIFFUSERS located near the bottom of each aeration tank. The bubbling air also keeps the biosolids mixed with the treatment flow. After spending about 6-8 hours in the aeration tanks, the flow is then distributed to the 135 foot diameter, 12 foot deep SECONDARY CLARIFIERS. 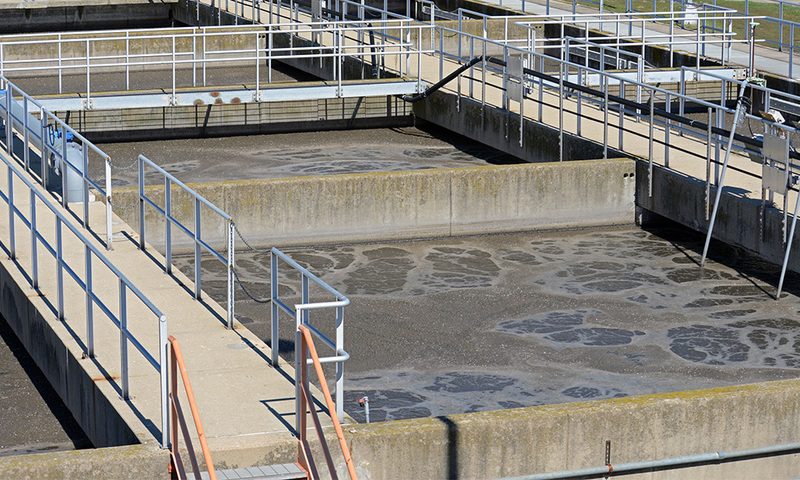 During the next 1-2 hours, the biosolids form a FLOC and gently settle to the bottom of the secondary clarifiers. The settled biosolids are now called SECONDARY BIOSOLIDS. 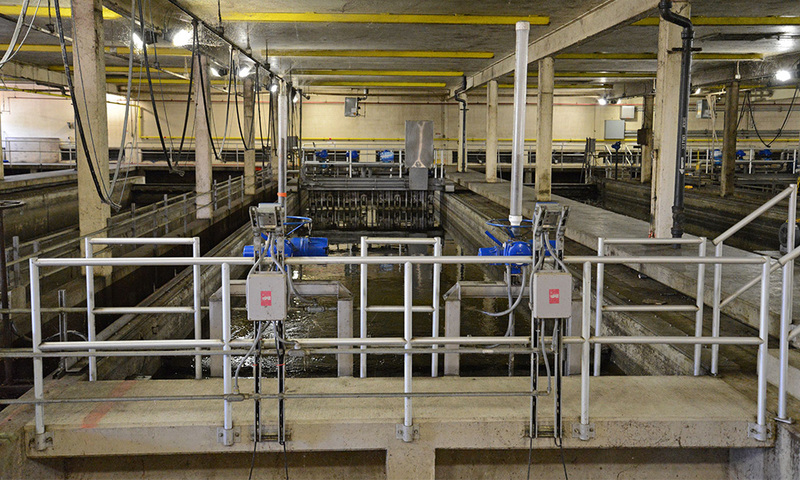 About 20% of the secondary biosolids are returned to the aeration tanks to continue the treatment process. The remaining excess of secondary biosolids are pumped to a separate solids treatment process. The clarified water next passes through high-efficiency TERTIARY filters. Here, the water percolates through special filter media where any floc escaping secondary clarification is captured. Hydraulic cleaners periodically remove the captured floc and return it to the start of the treatment process. The filtered water finally passes into the DISINFECTION TANKS. In the first part of these tanks, the chlorine added at the sand filters is given time to destroy any remaining micro-organisms in the water. 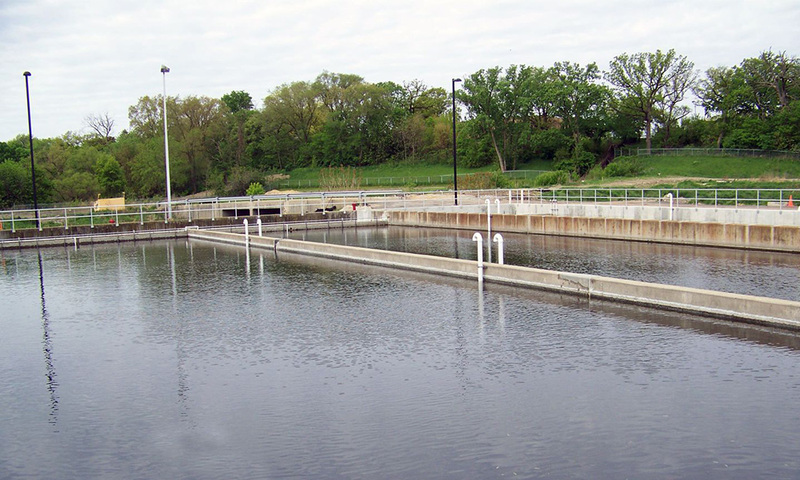 In the second part of these tanks, a small amount of sodium bisulfite is added to neutralize the unused chlorine before the cleaned water is returned to the Fox River. 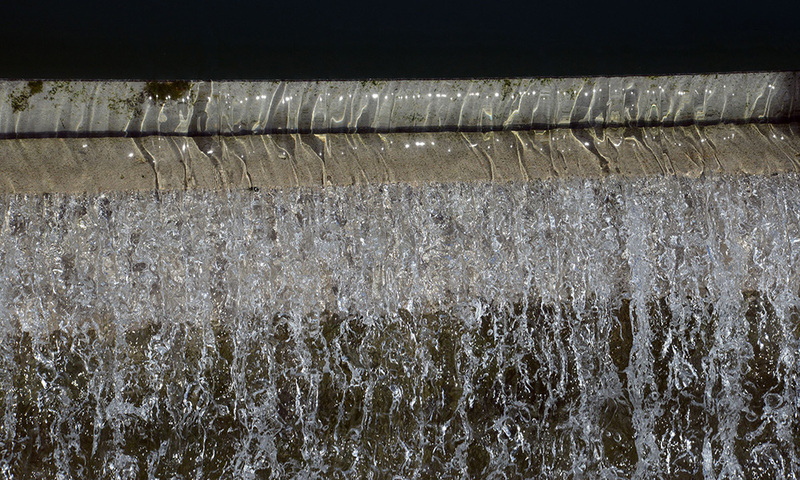 The last stage of the treatment process aerates the clean water a final time by allowing it flow, in a waterfall like fashion, over a weir and into the Fox River. 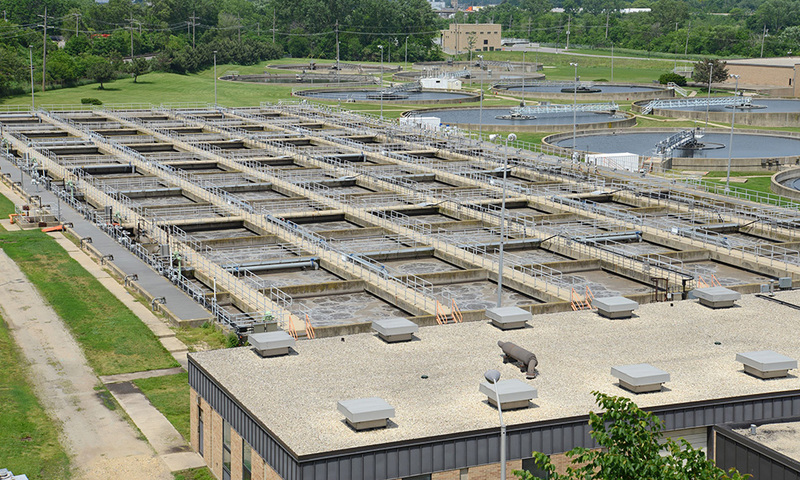 Each year Fox Metro treats and safely returns over 10 billion gallons of water to the Fox River. 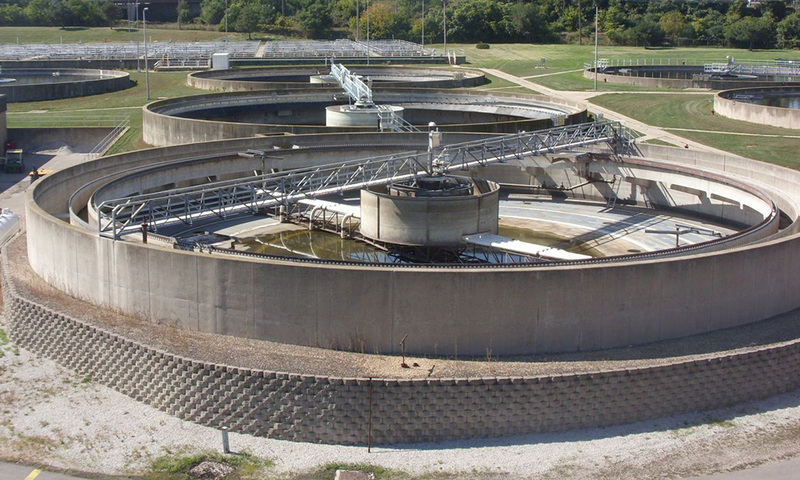 This concludes your virtual tour describing the wastewater treatment process and how the Fox Metro Water Reclamation District is "GIVING WATER A SECOND CHANCE" 24 hours a day and 365 days per year.